The GSU Middle East Studies Center will present a panel discussion “Trump and the Middle East” on Tuesday January 24 in the Troy Moore Library, 25 Park Place, 23rd Floor, Room 2343, from 3:00 pm to 5:00 pm. The discussion will be moderated by Allen Fromherz, director of the Middle East Center and Professor of History. Cairo, Michael F. The Gulf: The Bush Presidencies and the Middle East. Lexington: University Press of Kentucky, 2012. Gerges, Fawaz A. Obama and the Middle East: The End of America’s Moment? New York: Palgrave Macmillan, 2011. Haass, Richard. Restoring the balance: A Middle East Strategy for the Next President. Washington, DC: Brookings Institution Press, c2008. Lesch, David W. The Middle East and the United States: A Historical and Political Reassessment. Boulder: Westview Press, 2007. Lesch, David W. and Mark L. Haas. 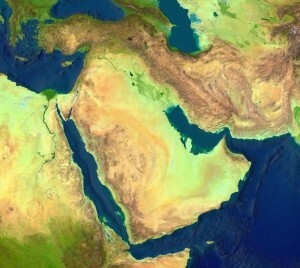 Middle East and the United States: History, Politics, and Ideologies. Boulder: Westview Press Inc, 2011. This entry was posted in Books, Global Studies, History, Political Science, Uncategorized. Bookmark the permalink.